What is NMLS (Nationwide Mortgage Licensing System and Registry)? 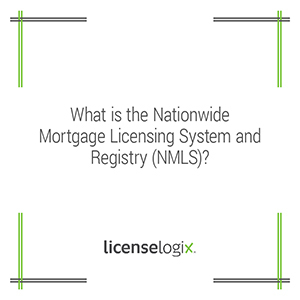 NMLS stands for the Nationwide Mortgage Licensing System and Registry. NMLS is a web based platform for regulatory agencies to administer initial license applications and ongoing compliance requirements. NMLS is used by participating agencies to process the applications of companies and individuals looking to apply, renew, surrender or amend licenses for various industries. NMLS is used by Mortgage Lenders, Mortgage Loan Originators, Money Transmitters, Money Services including check cashing and currency exchange businesses, and more. States continue to transition more and more finance-related industries to NMLS. For example, Indiana, Massachusetts and North Carolina now use NMLS for Collection Agency License applications, and many more states are expected to follow suit. NMLS makes the process of applying in multiple states easier by using a common tool and process for all participating states. You can register for exams, make payments, report authorized agents, renew licenses and more, all from the NMLS online portal. Often, each state will have its own supplemental attachments to the NMLS application. NMLS provides a checklist of requirements by state and license type. For example, Montana Mortgage Broker Company applicants are required to obtain a surety bond of up to $100,000. Pennsylvania Money Transmitter Company applicants must submit fingerprint cards for a Criminal Background Check for each control person. A Massachusetts collection agency license applicant must submit various different documents in hard copy via mail to the Division of Banks including financial statements, notarized documents with original signatures, and a bond. To use NMLS, businesses and individual owners must create accounts in the system. Authorized users can access the printable forms in their resource center and submit applications and some attachments online. State and industry specific attachments may need to be mailed, along with the checklist provided by NMLS, to the appropriate state agency within 5 days of submitting your application online through NMLS. LicenseLogix will guide businesses through the process of using NMLS. We can file all licenses and registrations required, minimizing time-consuming and costly delays. If you are already licensed, we can file renewals and manage ongoing compliance. For additional help you can fill in the form on the right or give us a call at (800) 292-0909.